The housing fix: Will it stick? Toronto realtor Barry Cohen had four purchase offers on the go on Thursday, when the Ontario government announced it would impose a 15-per-cent tax on foreign buyers, effective the next day. For a realtor who specializes in selling luxury homes to foreign buyers in tony Toronto neighbourhoods – with Chinese purchasers accounting for "a good majority" of his deals – the tax could have been a blow. But as of Thursday afternoon, three of the four purchasers were keen to proceed, and he expected the fourth would come back to the table on Friday. The Re/Max realtor says he is not worried a new tax will drive away customers. "If you look specifically at the Chinese … the feeling is that, 'I've got to get out of Dodge,' which in this case is China," he said. "And Canada is a safe place to be. The feeling is that if it costs me 15 per cent more, so be it. It's better than losing the bulk of the investment in China." The new tax on foreign speculators is the centrepiece of the Ontario government's 16-point package of real estate reforms unveiled Thursday, and the only measure specifically aimed at immediately cooling growth in home price increases in the Toronto region. Other new measures – such as enabling municipalities to tax vacant residences or inducements to encourage future building by developers – will take months to put in place and possibly years to bear fruit in terms of spurring new housing supply in the market. But with so many other market forces lining up to juice housing demand in the Greater Toronto Area (GTA) – not least of which is Ontario's new status as Canada's fastest-growing economy – real estate experts are questioning whether a foreign-buyers tax, designed with many exemptions, will be enough on its own to affect runaway price inflation. 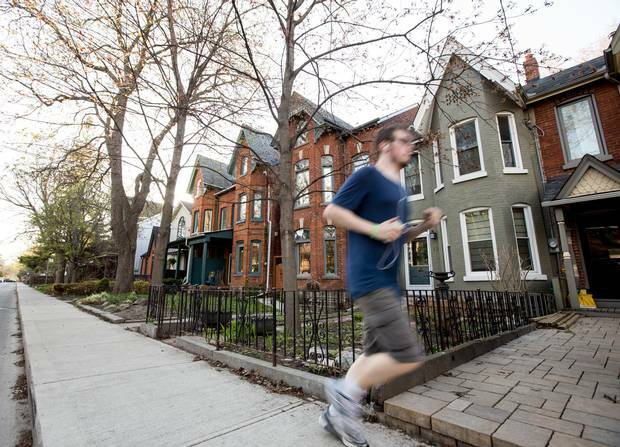 Residential realtor Adam Brind, a partner at Core Assets Inc. in central Toronto, said a foreign-buyers tax won't make houses more affordable in many residential neighbourhoods in the city of Toronto – areas such as Leslieville, Roncesvalles or High Park. He believes foreign buyers are playing little role in spurring price increases in those areas, which means there could be little impact for frustrated buyers. "Toronto house prices are not one problem – it's a perfect storm, and there are 12 to 20 reasons that have caused prices to go up," he said. Houses are seen in the west end of Toronto on April 21, 2017. Ontario Premier Kathleen Wynne described her government's new foreign-buyers tax as a "speculation" tax when she unveiled it at a news conference on Thursday, surrounded by condominium towers in Toronto's Liberty Village neighbourhood. Ms. Wynne stressed it is not aimed at immigrants and refugees who are living and working in Toronto – who will not have to pay the tax – but at people who have little connection to Toronto and are buying properties from abroad simply as investments. To accomplish that goal, the government will offer rebates to return the tax money to foreign purchasers if they later satisfy any of the exemption criteria. For example, Ontario will rebate the tax if a foreign buyer becomes a Canadian citizen or permanent resident of Canada within four years of a home purchase, if the buyer is a student who remains enrolled full-time for at least two years after the purchase or if the foreign buyer has legally worked full-time in Ontario for a year after the purchase. 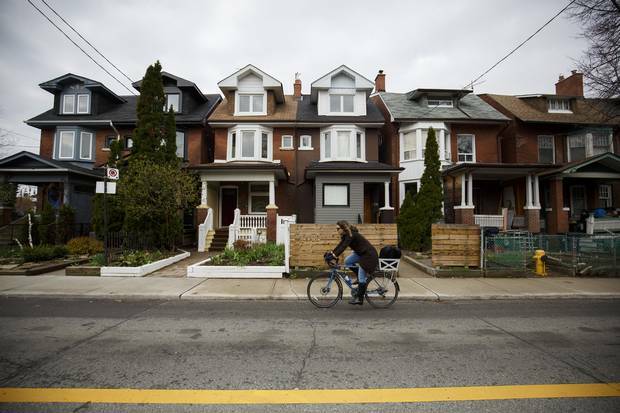 Real estate broker John Pasalis, president of Realosophy Inc. in Toronto's Leslieville neighbourhood, is concerned there may be too many exemptions, creating loopholes many buyers can exploit. He said there are relatively few foreign buyers who have "zero connection" to Toronto and will have to pay the tax. The biggest problem is the student exemption, he said, which will allow many foreign buyers to give their young adult children money to buy units in Toronto that will become investment properties after two years. "With all these exemptions, the number of people that actually might fit the definition is going to be really small. It's not going to have a huge impact on demand," he said. The province will begin collecting data on Monday on the citizenship of people who register new home purchases through the land-registry system, but there are no statistics available currently about the proportion of homes sold to foreign buyers in Toronto. A survey by the Toronto Real Estate Board last fall found real estate agents in the GTA estimated about 5 per cent of their clients were foreign buyers. If only a subset of that group were required to pay the new tax, however, the market impact could be relatively minor. Mr. Cohen, who deals with many Chinese buyers, estimated about 20 per cent of foreign purchasers he sees would not qualify for any of the exemptions and would have to pay the tax. Most of them would likely proceed and pay it, or would shift their focus back to Vancouver if they have to pay the tax in either market, he said. "People come to Canada, and specifically to Toronto, because it's a safe financial haven, a safe place to live and, by the way, real estate goes up every year," he said. 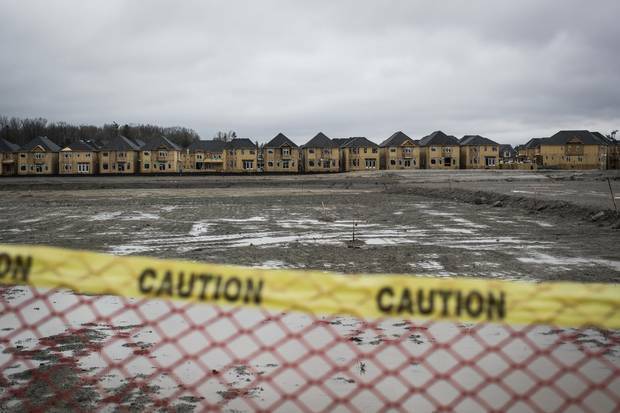 Houses under construction are seen in Brampton, Ont., on April 20, 2017. The limited reach of the tax is not the point, Canadian Imperial Bank of Commerce economist Benjamin Tal says. 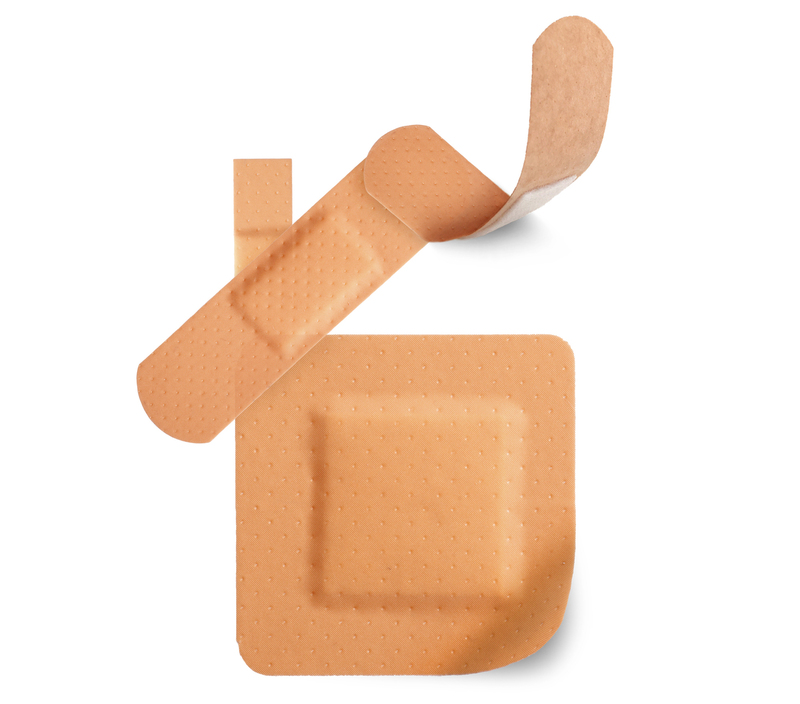 The point is its psychological impact. Mr. Tal estimates a minor part of the impact of the tax will be its direct cooling of foreign demand for Toronto region housing. The rest of the impact will come from cooling the expectations of the other players – including domestic buyers and sellers – if they believe the foreign-buyers tax will soften demand going forward. By reducing expectations of price growth, other speculators may leave the market and ordinary buyers and sellers may not be as frantic. "If there was 100-per-cent slowing, I think 30 per cent of it would be the direct impact and 70 per cent would be people waiting and seeing until the fog clears," Mr. Tal said. In Vancouver, the number of housing sales fell sharply in the months after a foreign-buyers tax was introduced last August, and sale prices for detached houses dipped slightly in the first quarter of 2017. Mr. Tal said the drop in sales was out of proportion to the number of foreign buyers who left the market, and was caused by other buyers moving to the sidelines to assess the impact. "By definition, it's a temporary thing, as we're seeing in Vancouver now," he said. B.C. government data show foreign buyers accounted for about 15 per cent of purchases in the Vancouver area last July, and just 0.9 per cent in August after the province imposed its 15-per-cent foreign-buyers tax. But demand started to grow again and foreign buyers accounted for 4.2 per cent in both November and December. The B.C. tax applied to a broader group of foreign buyers when it was introduced, but the provincial government said this year it would introduce some exceptions, including exempting foreign buyers who are living and working in the province. Royal Bank of Canada economist Robert Hogue said Ontario needed to do something immediately to take heat out of the Toronto market, and the tax was a quick answer, coupled with many other longer-term measures. The good news, he said, is the new foreign-buyers tax will apply to housing in a zone the province is calling "the Greater Golden Horseshoe" region, which is a vast crescent of land surrounding the GTA, stretching west to east from Waterloo to Peterborough and from Niagara in the south to north of Orillia. Mr. Hogue said Vancouver did not apply its tax to as broad a region, and it pushed foreign buyers just outside the boundaries to other communities. He is concerned, however, that pricing in Toronto may not respond to the tax the way it did in Vancouver. Toronto appears to have a lower proportion of foreign buyers in its market as a starting point, he said, and Vancouver's real estate market had already started to cool last spring, so the foreign-buyers tax simply escalated that effect. There has been no sign of prices cooling in Toronto, which means there's still a risk the tax could be absorbed and overrun by pent-up demand. "At this stage, Toronto is much tighter than Vancouver was when the tax was introduced," he said. "But we would expect this would have a market-psychology cooling effect on demand, and hopefully a tempering effect on price increases. It may not be as immediate as it was in B.C.… I would think this might take a little longer to see in the [Toronto] market." Houses with “sold over asking” signs are seen in Mississauga on April 20, 2017. The good news for Ms. Wynne is that some real estate experts say there are signs in recent weeks that Toronto's market may be balancing out, which could be accelerated by a foreign-buyers tax. If she is lucky, the foreign-buyers tax may even end up getting credited with spurring impacts that were coming anyway. 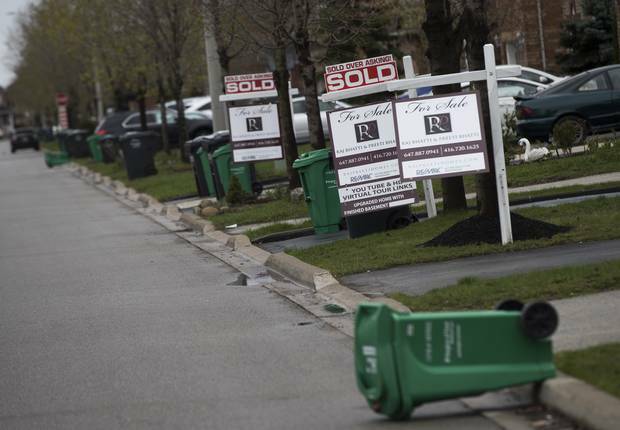 New listings of detached houses were 62 per cent higher in the first week of April compared with the same period a year ago, Mr. Pasalis said, marking the third consecutive week of significant increases in home listings in the GTA. Dianne Usher, senior vice-president of strategic growth at Johnston & Daniel, a realty firm specializing in the luxury market, said more resale-home inventory has come onto the market in the past 10 days "than we've seen in the better part of a year, in terms of one lump sum." She said agents are seeing fewer offers in bidding wars and even some houses that haven't received any offers on the preset bidding date. Combined with a foreign-buyers tax, the two factors will slow the rate of growth in prices, she predicts. But she does not anticipate actual price declines, which means "affordability may still be an issue." Royal LePage realtor Shawn Zigelstein, who is based north of Toronto in Richmond Hill, said he has also seen more inventory pop on the market in the past two weeks. "We are seeing houses that were selling in multiple offers not selling as much over asking, or not sell on offer night at all," he said. He said it may turn out the province didn't need a foreign-buyers tax to see the market move back toward equilibrium. "I think the government jumped the gun a little bit," he said. "I think if they said, 'Let's wait three weeks and see what happens,' we'd be in a totally different place than we are right now." However, it's unclear whether the surge in listings is a lasting trend or whether it was caused by widespread expectations the Ontario government would be announcing new measures in April to cool the market. Mr. Pasalis said some of the surge in listings this month may have come from people rushing to put their houses on the market before expected new taxes took effect. The result is that listings later in the month or in May could drop if many sellers simply moved ahead their listing dates. "We'll know in a month or a month and a half, because you may see fewer listings in May and June if they came forward and got listed ahead of schedule." Toronto’s Roncesvalles neighbourhood is shown in this 2015 photo. Ontario is coming relatively late to the foreign-buyers tax party. Many other jurisdictions – including Australia, Singapore, Hong Kong and Vancouver – have already introduced restrictions to try to curb speculation by foreign buyers. Economists say one clear conclusion is that foreign-buyers taxes tend to only work in the short term. Determined foreign investors often sit on the sidelines while they assess the impact, but eventually factor in the tax and come back to markets that remain broadly attractive. Mr. Cohen said many foreign buyers have become accustomed to paying some form of foreign-buyer tax in many of the most popular alternative locations, and will still find Toronto – and the Canadian dollar – comparatively affordable. If the foreign-buyers tax is brushed aside, however, Mr. Hogue said Ontario may have to go further, and a logical next step could be a broader speculator tax that targets anyone – including domestic buyers – who flip properties quickly. He said such a tax is harder to craft and collect, and he understands why the province started where it did. "We do suspect that this speculation in the market goes much beyond foreign buyers – it's much more broadly based," he said. Ontario Finance Minister Charles Sousa made it clear he was trying to find the right balance as a starting point. In recent weeks, he has repeatedly stressed that he did not want to close the door to foreign investment in Ontario, and said he feared going too far with measures that would lead to a significant price correction. He warned he had to weigh steps to cool house prices against potential adverse impacts for people who already own homes. "There's unintended consequences from anything that we do," he told reporters at a news conference on Tuesday. "I don't want to be doing anything that may be harming others."